I swim regularly, usually twice a week. I really enjoy the sport and think it is great that I can raise money by doing something that benefits my general well being. I learnt to swim as a child but became serious about it when I worked at a further education college that had a 30m pool in the basement – I could swim in my lunch hour. I then joined a health club with a pool. When I did my first Swimathon in 1996 there wasn’t an online option so I went round all my friends with a sponsorship form. I then had to retrace my steps to collect the money after the event. Nowadays I use my fingers, not my feet, and initially email everyone in my contacts list even if I haven’t seen them for a while. Every few weeks I send another email to those who haven’t sponsored. I don’t do it as a reminder as I think that can put people off - I call it an update. I also keep the sponsorship form in my handbag at all times just in case. I’m never embarrassed to ask someone to support such a good cause. I usually go swimming on my own, that way I can go whenever I am free and I don’t have to fit in with anyone else. To me that’s one of the joys of swimming. I try to go at least twice a week and am gradually increasing my distance from my usual 750m to the 1,500m. I am also trying to increase my speed. I only do breaststroke but in the past have swum the 1,500m in around 44 mins but I would ideally like to get this down to nearer 40 mins. My friends and family are very proud and supportive. I think my grandchildren were the first to sponsor me. My husband keeps trying to think of people I can ask to sponsor me who I may have overlooked. He is also more than willing to come to the pool to count my lengths and time me. This year, I was tempted to do the 100 length challenge but I will be 68 by the time I do the Swimathon, so thought I would stick with the 1,500m. My challenge to myself this year is to complete it quicker and raise more money than last time. 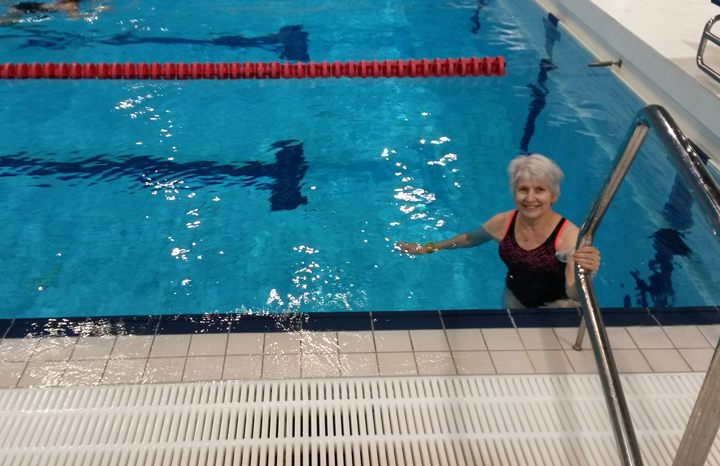 I would like to encourage people to take part by saying that I will be 68 when I do the Swimathon and have been retired for just over three years, so you don’t have to be young, super fit and have work contacts to do the swim and receive a respectable amount in sponsorship. So far I have raised more than £600. I have always thought Sport Relief was a well-run charity that uses all the money it raises to help the people it was raised for. I like the fact that the monies raised aid people in need both in the UK and abroad. Whilst I think we must look after our own people, I think we also have a duty to help those abroad not so able to help themselves. I did not take part in the Swimathon last year as I wanted to be able to raise as much as I could for Sport Relief this year and there are only so many times I can ask people to sponsor me! Could reading for pleasure become a thing of the past?